One of the best things I ever did was save all of my MS t-shirts. On my 5 year diagnosis anniversary I packed them all up and brought them to the "quilt maker." This quilt is so much more than patches of fabric sewed together. 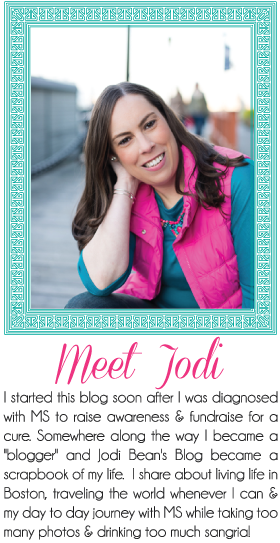 It represents so much more and it is a visual reminder of my MS journey. 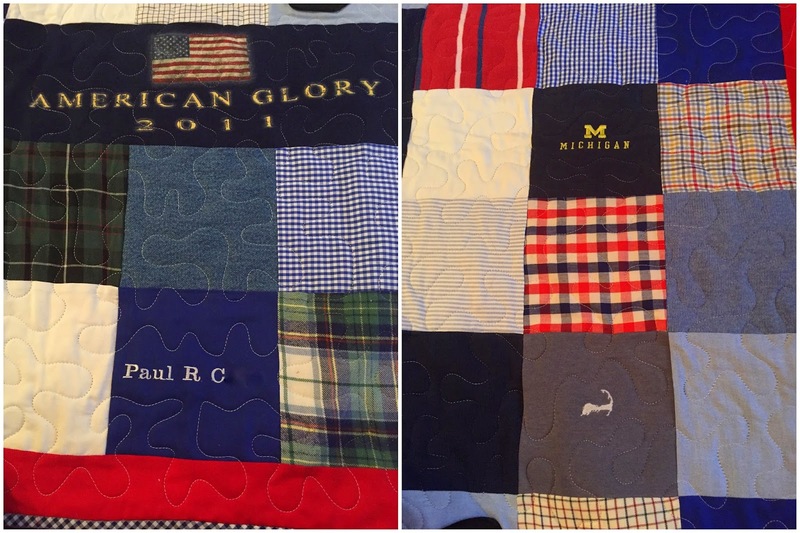 My dad liked my quilt so much that he finally took the plunge to have a quilt made too. Little did I know that he had been saving his "favorite" shirts for many years! 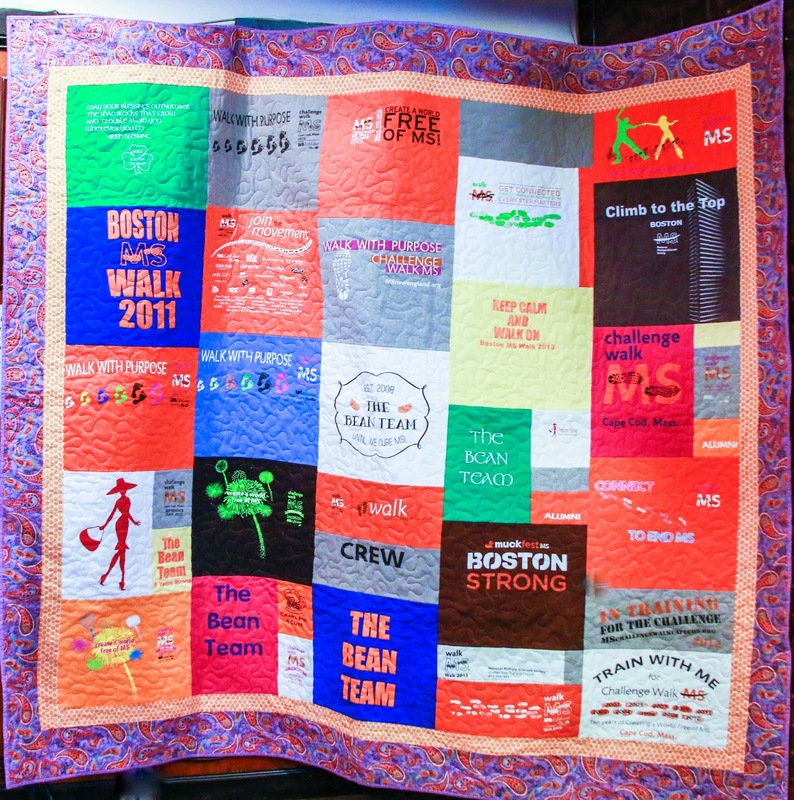 Of course most of them revolve around sports but you will notice that a Bean Team/Boston MS Walk shirt also made the cut! My dad now has t-shirt quilt on the bed in their guest room. A blanket filled with memories put to much better use than a bag of old shirts sitting in the basement! My mom loved both of our quilts but probably didn't know at the time that she would soon be presented with an opportunity to have her own made. My grandfather died at the end of April last year and my mom and I had already previously booked a trip to visit him in June so we still went. It gave my mom an opportunity to go through my grandfathers belongings with Lee. That's when she had the idea to use his clothes for a quilt! 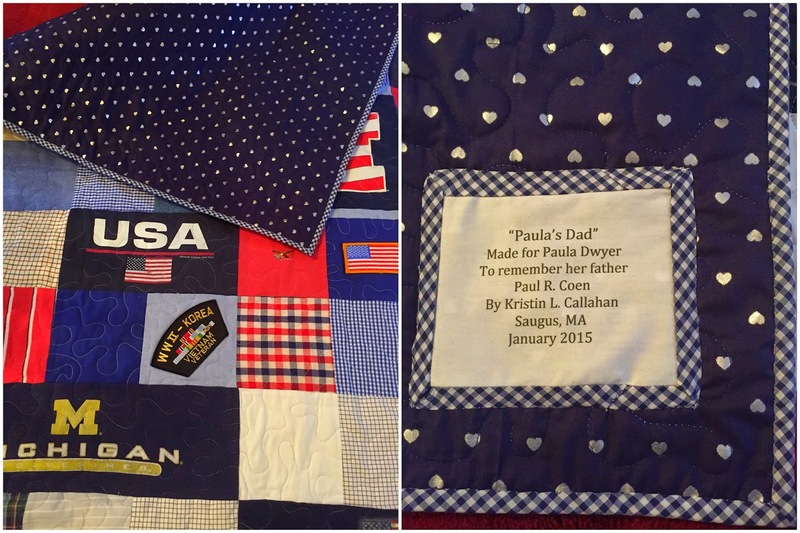 She now has a memory quilt made with pieces of his dress shirts, jeans, sweatshirts and more. She also has a patch for each of the three wars he was in and a POW patch. It really is a beautiful representation of so many different parts of his life. A little story on how I found the "quilt maker" Kristin. One day at work I casually mentioned that I was going to have a t-shirt quilt made and was looking on etsy for someone good. Wouldn't you know that my office mate/friend tells me that her sister is a quilter and had made several t-shirt quilts! I was so glad I had said something because it was so amazing to work with Kristin. She is very talented and has so much passion for her hobby. It was great to have a personal connection to the person making it rather than finding a stranger on the internet! I'm sure Kristin never expected that she would end up making three quilts for my family in a little over a year but we're smart and when we find someone talented we monopolize all of their free time. Haha! I highly recommend Kristin if you are considering making any kind of t-shirt or memory quilt in the future. She will do a custom design and let you be as involved as much as you would like. We all picked the fabric on the back of our quilts and gave input but then let Kristin have artistic control to do what she does best! I think you'll agree that the results are fabulous!!! 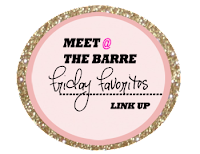 Linking up with these ladies for Friday Favorites because these quilts are definitely favorites!!! Those are so awesome! What a wonderful way to capture the memories. Have a wonderful Valentines. These quilts are awesome! Thank you for sharing. I remember when you shared your quilt on a post awhile back ( a really long time ago) I think it's a great way to preserve memories with something that is useful! Everyone needs a quilt, especially these cold winter months! Those quilts are so fantastic!! Love them! What a wonderful way to preserve memories. Have a fab weekend. Wow that is absolutely fantastic and so special! That is a lot of work and love! And what a wonderful idea to turn your Grandfather's clothes into a quilt! What a great way to honor and remember him. It came out beautifully. These are so cool! My sister made one for my husband a few years ago. It's awesome because he wouldn't part with all those old tees but never wore them. I should start saving some of my kids' favorite shirts to do this too.